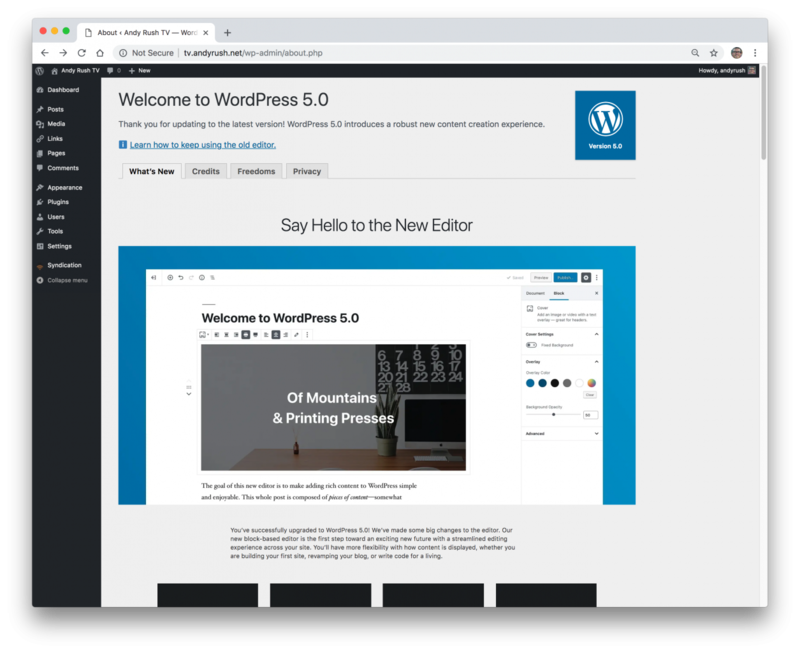 WordPress version 5.0 was released December 6, 2018. It’s a major update that will substantially change the look and feel of the editor you use for your posts and pages. The new editor is popularly known as Gutenberg, though some people will refer to it as the “block editor”. Either way, it’s a radical shift from the “classic editor” that you are used to. 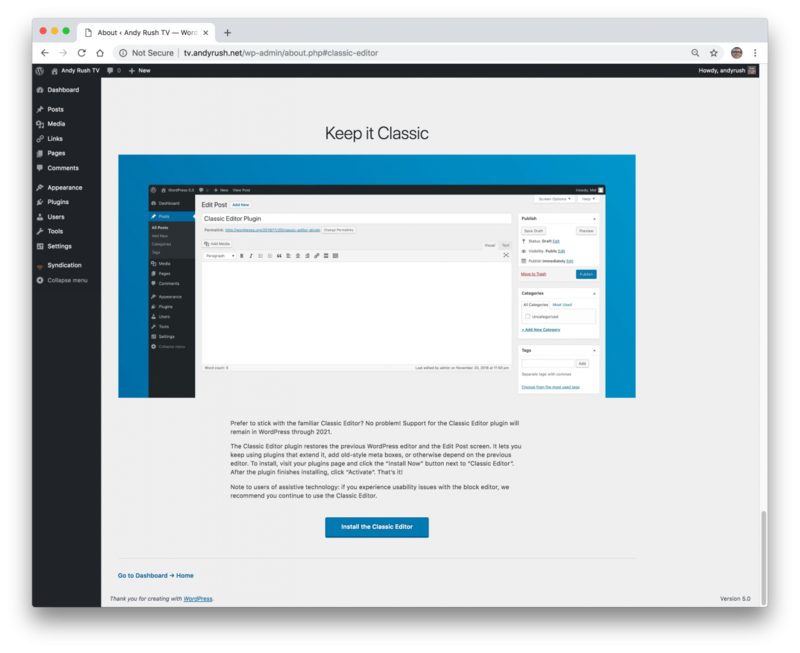 This brief article will make you aware of the changes that will happen if you upgrade to WordPress 5.0, and if you don’t like the changes, how you can switch the editor back. If you upgrade, you will see the Welcome screen (if you already dismissed the Welcome screen, login and then navigate to your site, then add /wp-admin/about.php to the web address). This screen will give you an overview of what has changed and what the editor will look like. Basically this “block” editor will allow you to drag and drop elements in your post or page to add a specific piece of content, like an image, heading, video, quote, etc. You could do this before, but the difference is that you have greater control of how it’s placed in your document. Each new paragraph is a new block, and those blocks can be manipulated in new and attractive ways. At least that’s the theory. 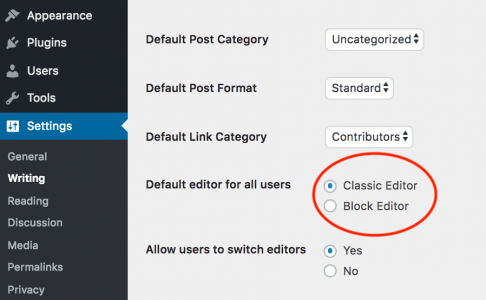 You may not like the new editor, and that’s why WordPress gives you the option to switch to the “classic editor”. To do this, you have to have the Classic Editor plugin installed. Once activated, that will turn off the block editor (aka Gutenberg). 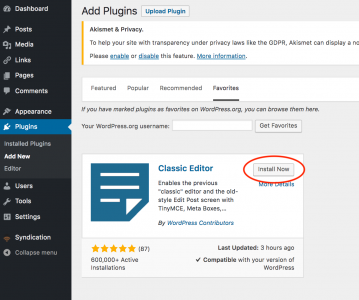 We have some information about plugins that might help if you’re unfamiliar. If you want to hold off using the new editor and you’re still on the Welcome screen, click the link that says “Learn how to keep using the old editor”. That will send you to the Keep it Classic section. Click the button that says Install the Classic Editor. That will take you to the Plugins page and will display the Classic Editor plugin. Click Install Now. Then click the Activate button. Classic Editor will now be in use. Ultimately, we think WordPress 5 will be a nice upgrade, but not everyone will be ready or prepared for it right away. There are also issues with how the new block editor handles accessibility. The WordPress 5.0 Announcement will give you some good general information about the new version. Maybe you just want the answer to What is Gutenberg? As always, if you have any questions, contact us.